Direct mail is still a powerful marketing tool. We make yours stand out. For impact and attention, we can produce the application in full bleed color. Choose from standard 4 color process, spot color applications, or a combination of both in up to ten colors. Apply a spot varnish to highlight a specific area, creating a high gloss effect or a subtle varnish on a graphic or text alone on white. Emboss an area, or word to call-out that specific section. Our slitting and die cutting capabilities can allow you to insert a card or promotional item into a pocket calendar or business card. This is a great feature that generates recipient interest and anticipation. Need a reply envelop built into a one part mailer? We can do this using our adhesive application capability. For many applications, a unit set pasted along two edges creates a unique package. By removing a stub along one edge of the document, the document opens and reads like a booklet, providing logical step-by-step arrangement of the materials being presented. Here are some of the reasons to consider using a multi-part set and the features King can build into Direct Mail applications. Need space for lengthy text, photos or explanations? We can build a mail piece with up to 8 parts. Need a reply envelope in a multiple-part piece? We can build a return envelope using either rewettable adhesive or transfer tape on the sealing flap. Sometimes the best way to get the message across to recipients is with a pre-constructed self-mailer. King offers two basic methods to provide this vehicle. This construction allows the use of multi-color design on the face of the envelope with the private text and message portion of the inside. Designed for imaging by impact printers. The newest product in our Direct Mail offering is our KingSeal Pressure seal product line. Like conventional pressure seal products, it offers a multitude of advantages and benefits for all parties involved in the Direct mail campaign. For the creative group, many of our special features available on one-part web products can be incorporated into our pressure seal self-mailer, including different papers and process color or multi-color printing. 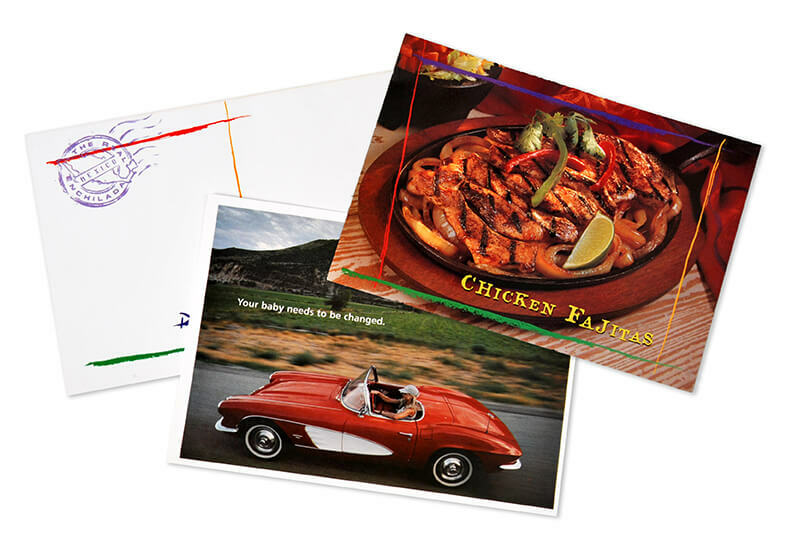 For the direct mail imaging group, it offers the ability to be imaged by impact printers and either continuous or cut sheet laser printers. For high volume continuous applications, we can also produce the application in roll format. By utilizing folder/sealer equipment, post-processing operations are significantly streamlined, reducing labor costs and getting the documents into the mail stream sooner. By using the laser printer to image the bar code on the face of the envelope while simultaneously adding the other variable data, it’s possible to eliminate addressing and other post-processing steps. Applications include refund and rebate checks, solicitations, product notices, and other one-way mailings.